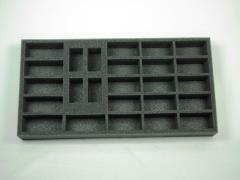 This tray can hold seventeen Sherman Tanks and four Stuarts. This will allow you to safely store your company HQ tanks, two platoons of Shermans, one platoon of Shermans with 76mm guns and four Stuart tanks. Are you working on Mid War? Then swap out the Sherman tanks for Lee tanks because they fit as well. If you don't want to field full platoons, the recovery vehicle will fit in the large cut-out. You can add in some Sherman (105mm) instead of a compliment of five tanks. 1.5 inch (38 mm) thick tray with 6x 3 x 1 1/4 inch (76 x 31 mm) cut outs, 4x 2 x 1 inch (51 x 25 mm) cut outs and 15x 2 1/2 x 1 1/4 inch (64 x 31 mm) cut outs.